Looks great with the spread. This Sunfish bolster pillow from Taylor & Olive will be an adorable addition to a chair, sofa, or bed where its ruffled edges and decorative floral accents can brighten your space. 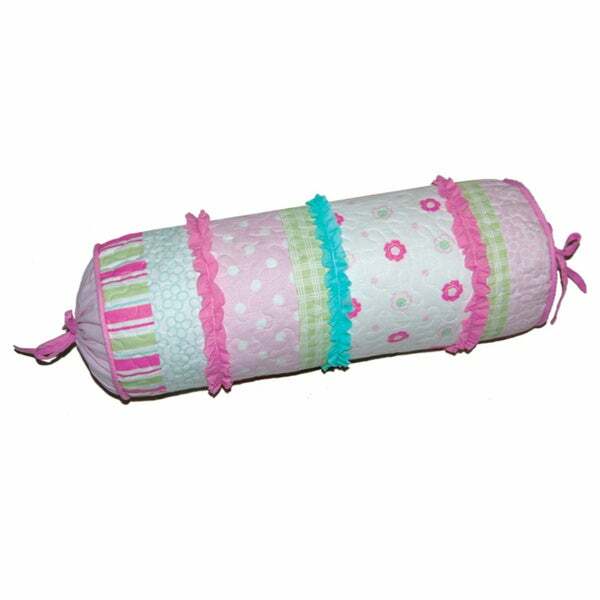 The cotton and polyester construction of this pillow make it durable and machine washable for your convenience. Cute accent pillow to go with the line's Cotton Quilt Set. Comes with the bolster insert as well and finishes the set nicely. This is a great pillow! When I bought the bedding the pillow was out of stock so I just kept checking and only a month later they restocked! I was so excited to now have the complete bedding set. It looks adorable in our daughters room. Cute pillow. Bright and vibrant colors and goes great with the matching quilt set. High quality and very nice. My daughter loves this, it is highly recommended. Cute, decorative pillow. My daughter loves it. Perfect addition to her bedding. Love the pillow goes well with the bedding I picked to my toddler. Good size and nice soft stuffing. Only down fall is the ends untie often and you gotta constantly retire. Nice addition to the quilt set. The perfect compliment to the quilt. Really cute on the bed. I washed it and it shrunk, so do not put in dryer. So stinkin cute. It’s perfect for my daughters new bedroom. The colors look just as good in person as the pictures online. She’s so excited!